We're pleased to announce that Meryll wants a Cookie is officially released! After playtesting for over a year, showing it to both professionals as consumer gamers, we feel the project is finally ready to stand on its two legs (and break down the whole room along side it). This game is dedicated to my wonderful late partner, Thomas Wrobel, who will forever be an inspiration to me. Meryll is our collective joy and we're pleased to share it with you. 'Meryll wants a Cookie' was initially designed as a sandbox to test our technology and gameplay in. Over time, it grew into the proper game. The main design consideration of 'Meryll wants a Cookie' is what we'd like to call the 'Locked Door Problem'. Often in games the player encounters a locked door - it may not be a literal locked door, but it functions as one nonetheless. In order to proceed, they need to find the key, which is at the other side of the level. 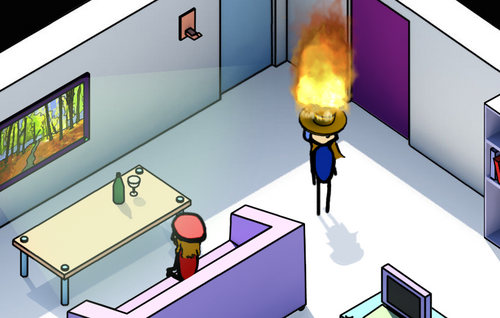 The player also sees there is a fire axe hanging next to the door. However, the game doesn't recognise your attempt to destroy the door with the axe; it still demands you to find the specific key to solve your problem. With 'Meryll' we explored different ways to deal with this issue, ranging from providing players many ways to achieve the same goal to creating an easy-so-use semantic system where interactions are largely decided by the properties that objects have, rather than hard-coded solutions.